Today’s post is probably the most “techie” post we’ve ever had… and may be the most techie we have on here for a long while. While we normally focus on how to help you generate online leads more effectively using inbound marketing as a real estate investor, we’ve been getting questions about today’s topic on a regular basis… so we thought we’d address it for those of you who are seeing this in your Google Analytics data and show you how to fix it. Recently we received a few emails from customer noticing weird sites from Russia showing up in their Google Analytics Data. Playing with google analytics and have a lot of visitors from Russia hitting my website. Should I be worried? I noticed in my analytics that I’ve had 400 visits to my website this month but I’m not seeing many leads. Should I be concerned? I’m confused because I’m not really doing much to generate traffic and don’t know where those 400 visits could have came from. These are both valid questions and ones we think need to be answered. So here we go, let’s understand what referral spam is and why you shouldn’t be worried. First, What Is Referral Spam? Referral spam clogging up our data for a short period… Since our members at our sister company Carrot are bringing in well over 130,000 visitors a month and 14,000+ opt in leads per month, even having 5,000 or 10,000 fake visits from a referral spammer can skew our data. But in this 30 day period in June, notice how many fake visits hit our servers. Over 195,000 fake visits in 30 days. In simple terms, it’s when an automated website crawler visits tens of millions of websites per day for a split second… with the sole purpose of showing up on your Google Analytics “referral” list. Now, these aren’t real visitors to your website… and now, spammers have gotten even smarter and are using different techniques that don’t even require them to visit your website to show up on your Google Analytics “referrer” report. They’re clever cats for sure. Because they’re preying on our innate curiosity as humans. If you were to log into your Google Analytics account and see several websites referring a lot of visitors to your website (like the shot above), you’re likely to be curious and go to those websites to see what they’re all about. Most of these referral spammers offer search engine optimization services (that you’ll want to steer clear of for sure, as they usually use techniques that Google doesn’t like)… and they’re hoping that a fraction of a percent of the people who visit their site end up as a customer. 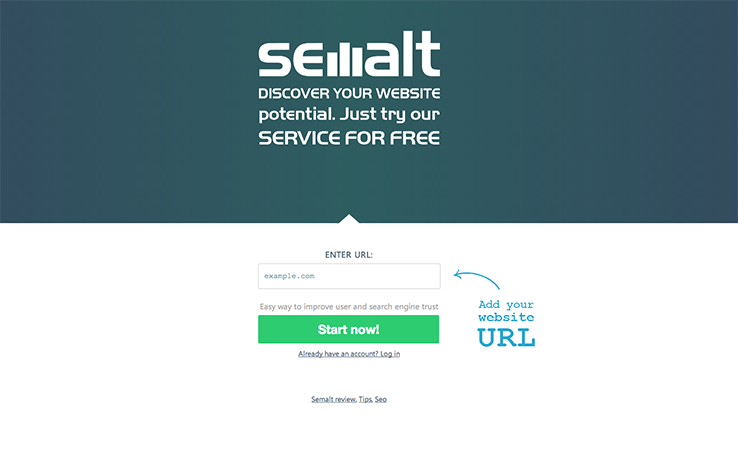 SEMalt is one of the biggest referral spammers… And when you go to their website they offer services to help “improve your search engine trust”. A very small percentage of people who saw SEMALT in their Google Analytics went to this site, put in their info… and bought. This very “dark” marketing tactic that the referral spammers employ should be a good indication of the quality of their service. Stay away from the services they offer. It must work, because these referral spammers keep on doing it. Now, there’s nothing that we’ve found that is dangerous to your website about referral spam. There have been adware or virus’ attached to some of these websites in the past, so don’t visit those websites, but in general there’s no real hard evidence we’ve seen of any direct harm caused by referral spam traffic on your analytics. It’s just annoying and really messes with the accuracy of your Google Analytics data. Notice the surge in “traffic” in the first 2 weeks of June… then after we blocked the spammers notice the sharp drop off. We’ll show you how to protect your own website and analytics from referral spammers. This is a proactive process we take as soon as we see referral spam starting to hit members websites, we block it from the server so that same URL can’t affect your website anymore. … we noticed a referral site named Semalt was affecting some of our member’s Google Analytics accounts so we made an .htaccess rule (fancy speak for, “we took are of it” 😉 that blocked them from visiting our server and our member’s websites. Check out the screenshot below from our analytics from October 2014 – January 2015 when the SEMALT referral spammer was hitting a handful of members’ websites…. and notice the dramatic drop in the blue line after we put that in place. Again, this has nothing to do with helping you generate more leads, but everything to do with helping you as a real estate investor make sense of your Google Analytics data if you’re seeing referral spam traffic land on your site. Here’s an example of what it would look like in an htaccess file. Again, these kinds of things should go over the head of 99% of real estate investors. Why? You don’t want to have to be worrying about this kind of stuff… have a solid web guy help you… or leverage systems that worry about this stuff for you. But Semalt is just one type of referral spam coming from overseas (specifically Russia). The spammers are clever and persistent. When one of their websites stops becoming effective, they’ll spin up another website, start throwing spam “referrals” at millions of websites and capitalize on the small percentage of those website owners who’s curiosity gets the best of them. Yes, it is annoying, but not much can be done other then reactively blocking the referral spam websites that show up in your analytics reports (which we handle for you). Now, for those of you who are pretty geeky and like this kind of stuff… there is some type of referral spam that is currently almost impossible to squash. Some Russian referral spammers have discovered that they can get the same result (their website showing up on peoples Google Analytics reports) without having to have their “bots” actually visiting the website. They discovered that they can “scrape” the Google Analytics tracking ID from the website… store the ID #… and just ping that ID number over and over again with their fancy spam “bots”. This way, they can flood your analytics with their referral data, but the method to block them from your server like we showed above won’t work. What can you do about these ones? Right now, nothing. We’re all hoping that Google will take steps to prevent this on their end sometime soon. If they do, we’ll let you know. 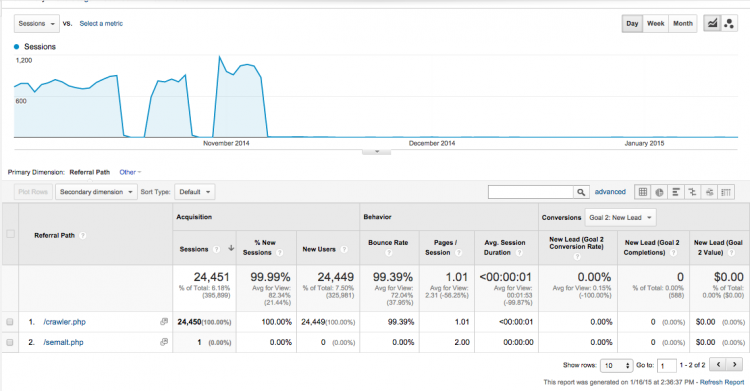 So, Does This Referral Spam Traffic Hurt My Search Engine Rankings? A lot of users are concerned that these visits are going to negatively affect their search rankings because of the high bounce rates and low “time on page” that the spam traffic leaves behind. 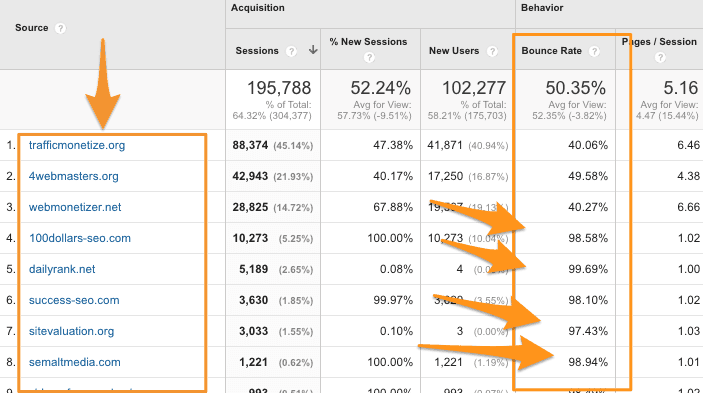 High bounce rates, but it shouldn’t effect your search engine rankings… because these bounce rates are from “referred” visitors vs. visitors who came from a Google search. After our research and talking with other SEO experts, there is likely no SEO effect because the spam bots are not coming through as organic search traffic (a Google search) but rather “referral traffic”. A high bounce rate can effect your rankings from what we’ve seen on visitors who land on your site from Google searches… but we haven’t seen data to show that high bounce rates from referred traffic has an impact. So don’t worry about this affecting your search rankings. Kapishe? You can add filters to your Google Analytics to not show the traffic from the referral spammers if you’re concerned about the accuracy of your reporting. For the best guide on how to do this, head over here to Moz.org. If you have a website that you’re hosting yourself or have on another website platform and you’re seeing referral spam show up in your Google Analytics account… have your web guy block the websites with our .htaccess file tip above. And continually keep an eye out for new spammers that pop up and keep sending the URLs over to your web guy to have them block those websites on your hosting account. In the end, referral spam isn’t something you as a real estate investor or agent should ever have to worry about or spend any time on. You should have someone on your team or align with a service to do all of that monitoring and blocking for you… so you can focus on what you love to do. But with the increase of referral spammers out there, it is important to squash them in their tracks if you want our Google Analytics data to be accurate and useful. I’m curious to see how many people reading this post are seeing referral spam on their analytics but had no clue what it was until today. Let me know in the comments section below if you’ve found referral spam on your own Google Analytics account.